"I've never been a great player. I just try to play with a lot of feeling and a lot of soul." says Ronnie Earl, the Master of the Stratocaster to the Tampa Tribune during an interview. Although few would agree with his first statement, the Boston-based guitarist who cut his teeth with Roomful of Blues, Big Walter Horton, Otis Rush, Jimmie Vaughan, Albert Collins and the great Muddy Waters, has unanimous approval of the latter. When Ronnie picks up the guitar, if you can't feel it, the diagnosis is simple: you've got a hole in your soul. In which case the prescription reads: daily listening to some of Mr. Earl's 25 plus recordings or witness one live performance for an instant cure. As Ronnie describes to Downbeat Magazine (March 1992) "It's soul music," he says about the blues. "My whole philosophy of playing is to play with soul. I see it in all the music I love. I love Charlie Parker. I love Ray Charles. I love Otis Spann. To me it's like breathing. I couldn't describe to you what it feels like to play, but to me it's the music with the most emotional life, soulfulness. It gives me that warm feeling that maybe some people used to look for in heroin and stuff." As the Boston Phoenix says: "There hasn't been a blues artist able to make the worlds of jazz and blues meet as gracefully as Earl since swing king T-Bone Walker." Ronnie's perfection of breathtaking dynamics in his trademark solos stem from his passionate and uncompromising style which is always distinctly his own. As B.B. King has said of Ronnie, " I feel the respect and affection from him that a father feels for his son. 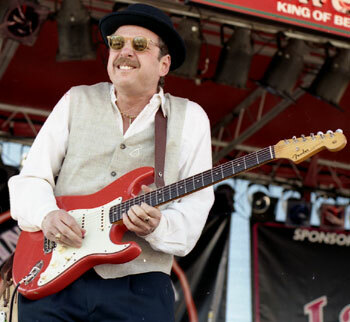 He is one of the most serious blues guitarists you can find today. He makes me proud." Ronnie has played for packed houses all over the world, from Madison Square Garden to the Montreaux Jazz Festival and all major festivals inbetween. As Guitar Player Magazine once said, " A guitar player's dream...Earl plays with the finesse of a Sugar Ray Leonard and the intensity of a Jake LaMotta." Guitar World Magazine adds, " When Ronnie get's on stage there's plenty happening. Only a few blues guitarists -- Albert Collins for one -- generate as much intensity and electricity as Earl does night after night. Ronnie plays each performance as though it were his last night on earth."